With less strength in the sunlight during the cooler months, areas of hard paving often remain wet for days (if not weeks) on end. This allows the likes of moss and algae to grow on the upper surfaces, causing slippery, hazardous conditions to fester. Tripping over in icy conditions is dangerous – ankles, knees and hips often come to harm as a result. Areas in shade or with poor air flow are most likely to become covered in growth, so pruning back overhanging or excess growth can help to abate the problem. It should be pointed out that moss, algae, liverwort and lichen don’t harm the surfaces upon which they grow. Rather than feeding on the hard surface as a parasite, these plant-like organisms simply use the area as a place to grow. In fact, a covering of moss on an old stone trough, or lichen on some ancient garden ornament can soften and age the look of the item in question. It’s only really necessary to control them on walkways. Bleach- and acid-based formulations of patio cleaners can be used with care (always follow the label instructions). Alternatively these growths can be physically removed. A screwdriver or sharp stick can be worked between block pavers and masonry pointing, for example, to remove excess moss. 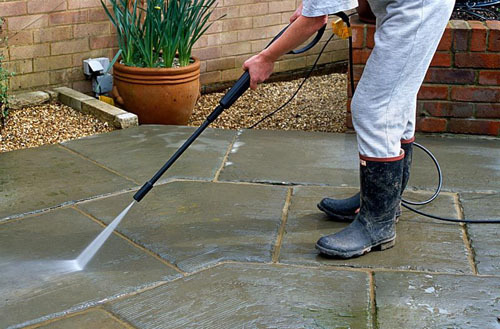 If you have larger areas to clear, consider a pressure washer but ensure that your paving is sound – the strong jet of water can dislodge loose fragments. If you fancy working up a sweat on cool autumn days, a stiff-bristled brush will work off the worst of these growths. This entry was posted in Uncategorized on December 7, 2015 by gapadmin.